The Arabs march on into Mesopotamia and Egypt. Meanwhile the bad news keeps piling up for Heraclius as he nears his final days. Here’s a question for the end-of-century discussion: What, in your opinion, marks the turning point between Late Antiquity and the Middle Ages? Ever since I started studying this period in detail, the turning point in my mind at least has been the 630s, since they seem to have marked a dramatic end of the traditional geopolitical balance of Christian Rome and Zoroastrian Persia, and the beginning of the long ideological struggle between Christianity and Islam that to a certain degree helps to define the Middle Ages. However, I have also heard many other opinions regarding the beginning point of the Middle Ages. What are your thoughts? I tend to mark the beginning of the Middle Ages starting after Phocas overthrew Maurice…After this event, the borders of the Empire begin to collapse, as the Persians and Avars/Slavs and Lombards take territory after territory. During the early 600’s, the Empire begins to morph into the “Byzantine Empire”, as it’s territories are reduced to parts of Greece and Anatolia, and the Latin element in the Empire fades. Maurice’s reign is the last time the traditional borders of the Empire hold; in addition, the Greek language and Orthodox religion becomes the definitive culture features of the Empire. Poor fellow this Heraclius. Clearly a great Emperor, though the times and circumstances constantly conspired against him! I’m from Croatia, I love listening to your podcast. You have a good radiophonic voice, sharp and clear yet relaxed. I can’t wait for the part where South Slavs enter this Byzantium picture. The very notion “the 7th century” rings with a sense of identity in some nations in the Balkans, even today. If or when you deal with this south-slavic topic, bare in mind that you are entering something that is still a modern political topic, rather than something lying deep in the past. Those 7th century national myths (created much later) still matter in political conciseness around the Balkans. For example Croats proud themselves with it, it’s a foundational myth, a proof that we are in control over this land for 1300 years etc etc… Naturally when the opertunity presents itself we gladly point out that some other nation doesn’t have such a pedigre and that their land is also ours 🙂 Out of those confusions about what is a nation in political sense and what is an ethinc group, a war was born some 23 years ago. To end this post before it gets really long, I can’t wait to learn more about “the south slavic 7th century”, especially in a wider context (arab invasion). Hello, a great comment, I’m from the same locality and can’t wait to hear more about the Slavic migrations. It amazes me that many people still cling onto these dated notions of Slavic descent (to justify the land distribution along initial lines of settlement) in the light of more recent discoveries that seem to suggest we may not even be as Slavic as once thought. 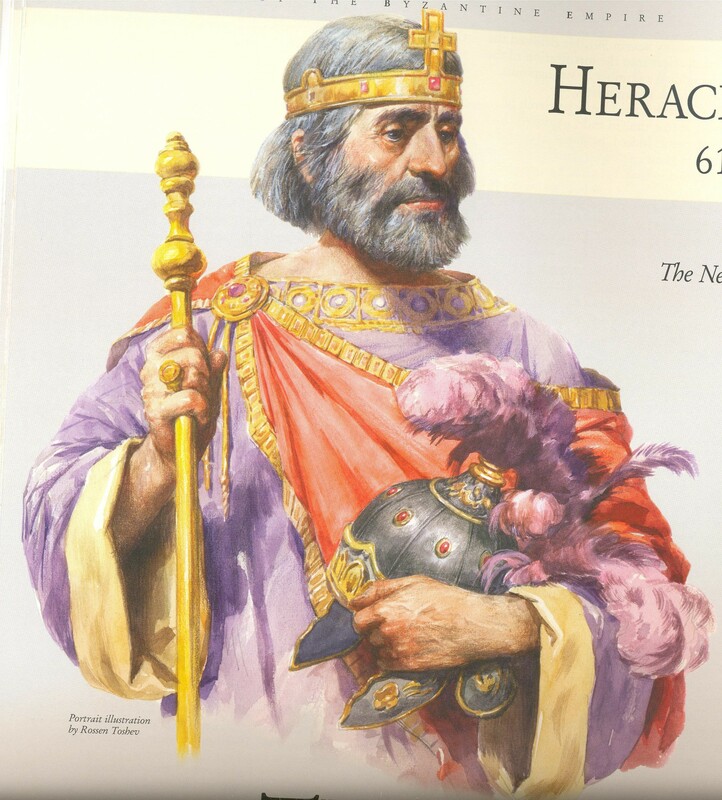 Could you give a description of the Arab armies that Heraclius was facing? I imagine scimitar wielding horsemen in loose, flowing robes, but I don’t see how such a soldier could pose a real threat to a Byzantine cataphract. Such a sad ending….too many borders to deal with that no empire could handle under these circumstances. If one would asked when the geopolitical empire ended it would have to be from this episode. New listener here, when I try to download older episodes it leads me to “page not found”. Is it just on my end or are these not up anymore? Thanks a bunch! Your series is great. 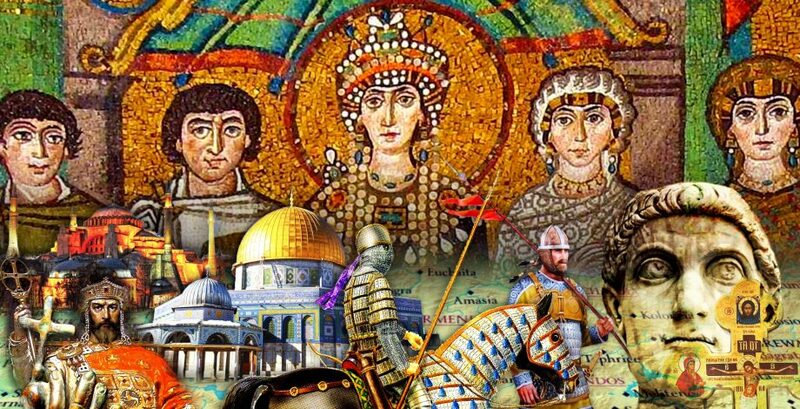 Question for the end of the century, and I guess it’s rather obvious given what we’ve just heard, but anyway: does Byzantium collapse to the same degree under the Arab onslaught if Heraclius, or even Phocas before him, successfully sued for peace with the Persians? Why were most, if not all armies, smaller than those fielded hundreds of years before? Having listened to the History of Rome, and your excellent podcast, I see the reasons why the Romans fielded smaller and smaller armies, but why does the same hold true for the other nations nearby? I don’t see the barbarians to the north fielding 80,000 man armies like they did in the good old days. Most of the armies in the area are much smaller than they were in the past. Was it some mix of lack of nationalism/pride so no one joined the army, or the damage of plagues, or a weaker economy mixed with a dramatic increase in the cost of fielding an army? I just find it interesting that we have empires that are far more advanced and profitable than those found around 120 BC, yet they have weaker armies. Honestly, I can’t help but think that the Roman Republic of so long ago would wipe the floor with the Byzantine Empire, and the Sassanids for that matter. On a related note, you see this interesting rise and fall in the size of armies throughout the ages and I would just be fascinated to see if there were any writings on this issue. Just how much did Byzantine tax revenue dwindle?